Tensions between the United States and North Korea are making their way back into the news after a series of missile tests and presidential Twitter threats. Meanwhile, a conservative think tank—previously thought all but dead—has seen a resurgence in relevancy, thanks to its alignment with Donald Trump. The result is that the Heritage Foundation has provided much of the narrative backbone for North Korean/US relations in the age of Trump, making the rounds in dozens of media articles and television appearances. Heritage talking heads have been featured in North Korea stories in the Washington Post (2/28/27, 3/19/17), New York Times (3/16/17), AP (3/19/17), Christian Science Monitor (3/17/17), Boston Herald (3/9/17), BBC (3/17/17), Fox News (3/10/17), CNN (3/15/17), MSNBC (3/19/17), CNBC (3/7/17), Voice of America (2/24/17) and Vox (3/17/17). A lot of people have interpreted these latest actions, provocations by North Korea, as a direct message to the United States. Why, in your estimation is North Korea so focused on the United States of America? Who are these “lot of people”? What are the motives? Was there a poll of experts on North Korea’s intent? Soboroff doesn’t say. One key feature of reports on North Korea’s nuclear weapons program is the Hypothetical Scary Nuke Map that shows an entirely hypothetical, not-yet-proven-to-have-been-built intercontinental ballistic missile hitting the US mainland. The rockets had to be included in order to get the Big Scary Nuke circle to cover mainland United States, so the Times and Foreign Policy tossed in theoretical missile capacity to help round the threat up. 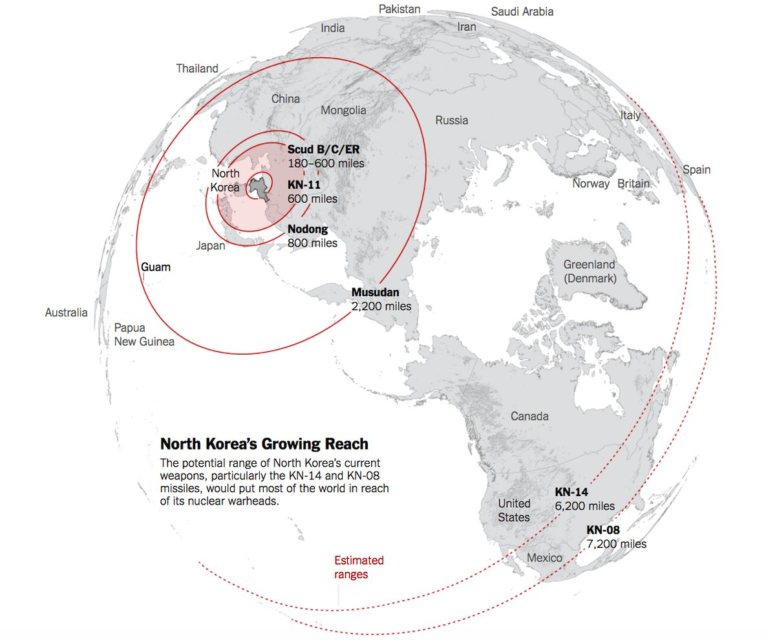 While the smaller circles on these maps represent missiles that have been tested, that should not mislead readers into thinking that the ranges claimed for the missiles have actually been demonstrated by North Korean tests. For example, the next-largest circle on these maps—a 2,200-mile radius that encompasses the Philippines, Guam and parts of Thailand—represents North Korea’s Musudan missile. 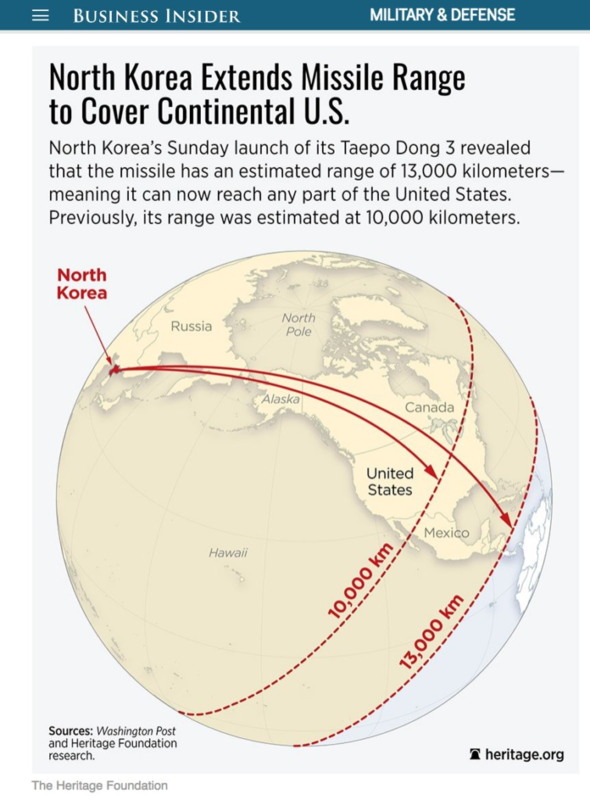 The missile in the successful test reached 250 miles (Business Insider, 6/21/16), a little more than one-tenth the range claimed for the missile by maps of the North Korean threat. North Korea has conducted one more successful test of the Musudan since then, achieving a range of 310 miles (CNN, 2/13/17). 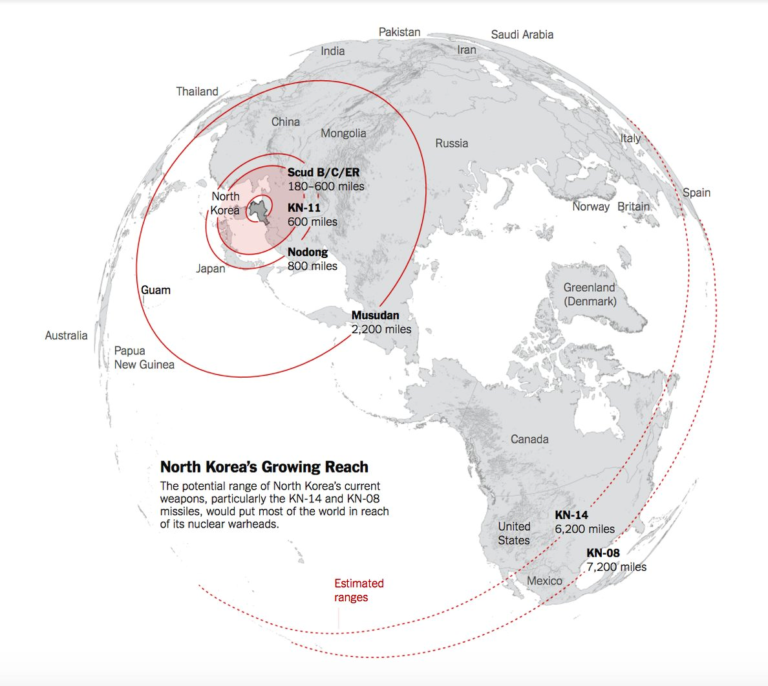 The furthest any missile has gone in tests by North Korea, in reality, is 620 miles, or 998 kilometers (New York Times, 3/5/17). Late Tuesday night, yet another missile test exploded “within seconds” of launching. Thus far, the assertion that this missile can reach Tokyo, let alone Thailand, remains speculative. Obviously, the former map is still a potential danger to the millions who live in its radius, but war narratives are rarely built on making up threats from whole cloth, but rather by exaggerating or hyping them. North Korea’s potential range is certainly newsworthy, but how many readers skimming these Hypothetical Scary Nuke Maps come away thinking these are tested, actual ranges based on current capacity? The gap between what’s objectively true and what’s possible blurs into a globe-consuming nuclear winter. 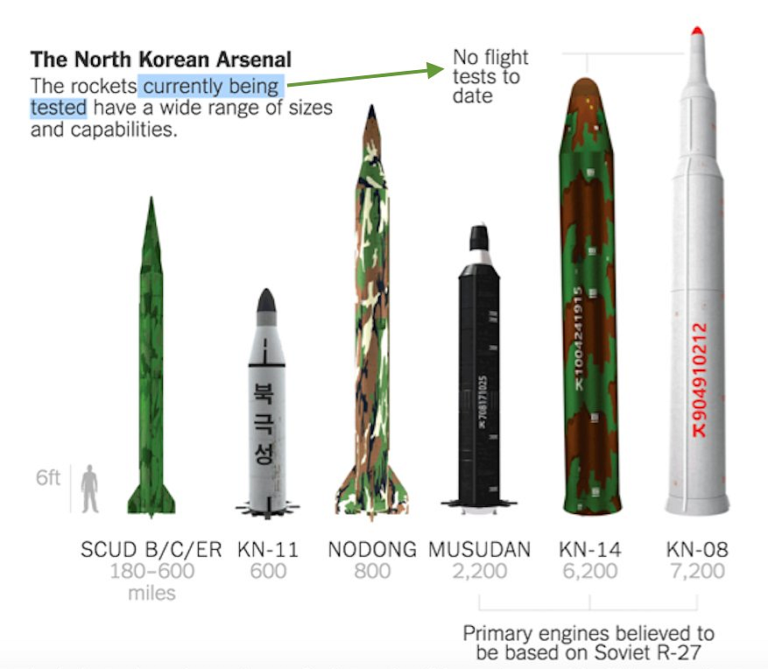 The graph is almost always inserted into stories about North Korea’s nuclear capacity but is, upon inspection, only about North Korea’s non-nuclear missile capacity. This sleight-of-hand may not have been the intent of the map’s creator—who is clear that it does not imply nuclear payload capacity—but that’s how it’s being presented in multiple articles, lumped together with headlines warning of North Korea’s nuclear ambition. Whether North Korea could reach the mainland US with non-nuclear missiles remains speculation. 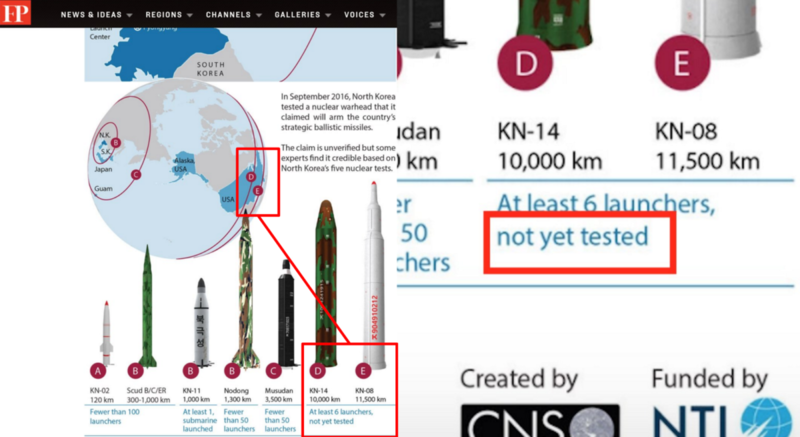 The Heritage Foundation’s own report on the topic (Daily Signal, 2/9/16) uses the qualifiers “may have” and “could” when describing the alleged 13,000 km range—a figure arrived at by looking at the technical components and abstracting out potential capacity, rather than actual evidence of a missile test. This calculation appears in a single byline-free report from Japanese outlet Mainichi (2/8/16), which doesn’t provide an original source for the number. Other outlets, such as Business Insider (1/13/17), Time (3/8/17) and Washington Post (2/8/16), report it’s unlikely or unknown whether or not North Korea currently has the capacity to bomb the United States, much less nuke it. According to Heritage Foundation’s Luke Coffey, the 13,000 km figure—needed to expand the range to include all of mainland United States—comes from the South Korean Defense minister. When asked specifically on what date the minister made this claim, or a link to where the claim appears, Coffey responded: “I’m not your researcher. Do your own research.” The only citation found on Heritage’s website was to the anonymous Mainichi source. Heritage does not disclose its donors, and has had issues of conflicts in the past. In the late ‘90s, it was criticized for accepting $1 million in funding directly from the South Korean government. A 2015 report in The Intercept (9/15/15) showed the cozy relationship between the foundation and military contractor Lockheed Martin, with Heritage building the requisite marketing collateral to lobby Congress to expand the F-22 program, urging the purchase of 20 planes for resale to Japan, Australia and “possibly South Korea.” Mackenzie Eaglen, the researcher named in the emails, vehemently denies allegations of a quid pro quo. The Heritage Foundation did not respond to request for comment from FAIR about its funding, and whether or not it currently receives donations from the South Korean government or its associated foundations. Though there’s been scattered reports of a falling out over the healthcare roll-out, the Heritage Foundation has been incredibly influential in the Trump administration, having written many of its budget-slashing proposals and shaping policy at a high level.